A microwave oven installed over the stove/range is out of the way and saves you time. Let Indy Install Service install your microwave oven. Our service area includes Indianapolis, Fishers, Noblesville and beyond. So, Call for a convenient time and a great rate too. Now, you have an option. Enjoy the difference! Indy Install Service doesn’t make you jump through hoops or wait for someone to come to your home and give you a quote. You get a simple quote right now! Cost for New installation (microwave has never been installed) — Labor and parts are $ 100.00. This includes removing the range hood and installing an electrical outlet in the cabinet above the microwave. Whoever you use to install your microwave oven, make sure they follow “Best Practices” during the installation. 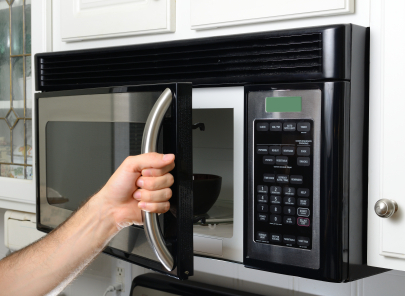 What are ‘Best Practices’ for mounting a microwave oven? Best practices are industry wide procedures for doing a particular task. In other words, a competent and “best way” to do things. Example: Most kitchen wall cabinets have a frame that overhangs the bottom. If yours is like this, oven manufacturers recommend that spacers be used between the bottom of the cabinet and the top of the oven unit. This will prevent damage to the oven’s frame, if the installer is over zealous. Since all microwave units are not the same, it’s a good idea for the installer to check the instructions. “What is the warranty on the installation? It is 2 years. The warranty on the oven itself is through the manufacturer. That information should be in your manual. Absolutely. You must have the wall mounting plate and the top mounting bolts. If parts are missing, contact the manufacturer with your model and serial number. Confused and/or concerned about using plastic in your microwave? Here is a link to an article. Check it out and reach your own conclusion.